Stylish. Functional. Mom Inspired. Three words that clearly define the wonderful products found on chictots.com. Even more amazing is the Chic & Cozy™ Blanket Bag that arrived at my door. I was amazed when I took it out of the box and unwrapped this brilliantly-crafted bag. Unique design combines 2 important baby products into one! It's both a carrying bag and a baby blanket! The original and ONLY blanket bag on the market of its kind. Awarded an About.com rating of 4.5 stars out of 5! Easily converts from carrier bag to baby blanket and blanket to bag. Large surface area for baby to play, be changed or sleep on. Bag can be carried as a tote or bag, just by how you change the handles when you convert it from a blanket. Concealed inner pocket allows for carrying of smaller essentials. Lush pocket material is so soft, you could even put sensitive items inside. For starters, take a look at the hip, funky print. Appropriately named 'Fuchsia Bloom', this pattern is filled with hues of reds and pinks, suitable for your little darling. The print even serves as a stylish compliment to any Mother's outfit. How's that for today's fashion-driven mama?! The size of the bag is enormous, but not overwhelming. There is just enough room inside the bag to hold all of your little one's essential items. You can place toys, wipes, a snack, diapers, and anything imaginable for a day out. The smaller pocket can hold your keys and cellphone to eliminate carrying a purse. This will all be conveniently camouflaged in the unique shoulder-style bag. You can even change the length of the straps, by following instructions, to turn the Chic & Cozy™ Blanket Bag into a tote. Where else can you find a product that serves as a bag, a blanket, is stylish enough to carry as a purse, eliminates the hassles of a bulky diaper bag, is 100% machine washable, and well designed? You guessed it...Chic Tots. It doesn't hurt that the product is based out of Maryland, my home state. Much thanks to Michele Good for her extreme patience with me. I am forever grateful for the opportunity. One winner will be chosen randomly using Random.org. You must leave your email address in at least one comment in order for me to contact you. You will have 48 hours to claim your prize. If there is no reply after 48 hours, I will choose another winner. Contest is open to US residents only. Ends 4/22/09 at 11:59 pm EST. That bag is not only pretty but a great idea! 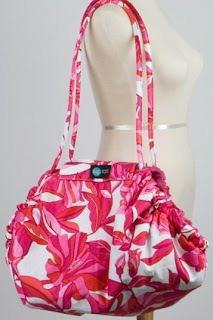 I also love the Eco-Chic Natural w/Pink Flowers Sling. Chic and Cozy has a lot of nice items. I like the Doggie Divas Coverall too. I follow Chic Tots on Twitter. This is a great idea and a cute bag. I went to the site and also like the wristlets - nice match to the bag you're giving away! The wraps are also nice, I used one with my daughter when she was a baby and it was such a great experience to hold her close. Thank you for doing all the work of a giveaway and thank you to Chic Tots for such a generous giveaway! I follow your blog and enjoy reading your posts. Your review was helpful for me - pointing out benefits like the fact that this bag is washable. I subscribe by email, that's how I found out about this particular giveaway. I faved you on technorati, I'm janetmom2maya. The eco-chic baby slings are hot! Eco-Chic Natural w/Bamboo Leaf sling! So many eco friendly and chic baby slings. Love them and this company!